When Avram Grant threw his scarf into the crowd at Upton Park after a disastrous 0-3 home defeat by Arsenal in January 2012, everyone present knew it was a gesture of surrender. The fans were stunned. This man had taken a bankrolled Chelsea side to within one kick of the European Champions League, but he had failed in less than six months at the Academy of Football. Four months later West Ham United were relegated. The following month, Sam Allardyce was appointed as Grant’s replacement. With no Champions League pedigree behind him, Allardyce could still point to major managerial success at the highest level, having woken one of Lancashire’s sleeping giants, Bolton Wanderers, and taken them into European competition over an eight year period. The only thing on the minds of West Ham fans was could Sam get their beloved Hammers back into the Premier League at the first time of asking? And, pretty please, would Sam mind taking them there playing football the West Ham way? The pre-Grant, best bits of Zola and Curbishley, few decent Pardew periods, Redknapp flashes and, ultimately, the Lyall and Greenwood years. If that wouldn’t be too much to ask. So just what is ‘The West Ham Way’? Well it’s not like ‘Wembley Way’ or the ‘Brian Clough Way’ (also known as the A52). And unlike those two roads (Wembley Way is, technically speaking, ‘Olympic Way’) it exists only as an abstract concept about how football ought to be played, To be honest, even the concept hasn’t existed for about ten years. So what is it? And where did it go? And if they can find it, can West Ham get back to playing it after all this time? 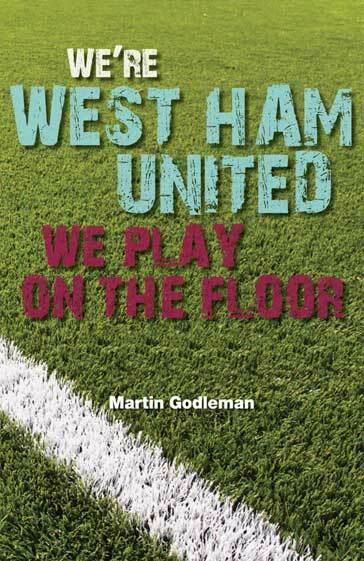 Martin Godleman has worked at West Ham United for 21 years as a journalist, commentator, DVD producer and even matchday announcer for nearly half a season when Jeremy Nicholas went on a 2008 sabbatical. He loves this club and all the crazy things that happen to it. Read his match by match story of the 2010-11 promotion season within these pages. And why wouldn’t you want to? We’re West Ham United, remember. We play on the floor.